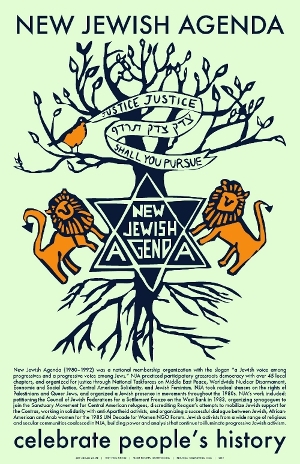 Ezra Berkley Nepon‘s Justice, Justice Shall You Pursue: A History of New Jewish Agenda is published by Thread Makes Blanket Press and distributed by AK Press. The book includes a history expanded from this website and two afterwords pieces: an essay by historian Rachel Mattson reflecting on why this history is so crucial, and an essay by JFREJ board member Daniel Rosza Lang/Levitsky reflecting on current Jewish activism in relation to NJA’s history. The book and poster feature original cover art by Abigail Miller. This website is an online version of Nepon’s 2006 Undergraduate Senior Thesis for Goddard College, envisioned as a tool for sharing my research and as a resource for education, inspiration, and analysis about the recent history and future of progressive Jewish activism. To read more about why I made this site, click here. My appreciation to the Tamiment Archives in NYU’s Bobst Library. A full list of sources can be found on the Works Cited page. Though many people gave advice and insight to this project, any mistaken or incorrect information is my responsibility alone. I can be reached at ezra.nepon at gmail dot com.